Every month at Lulupu we like to 'STAR' a talented crafter. 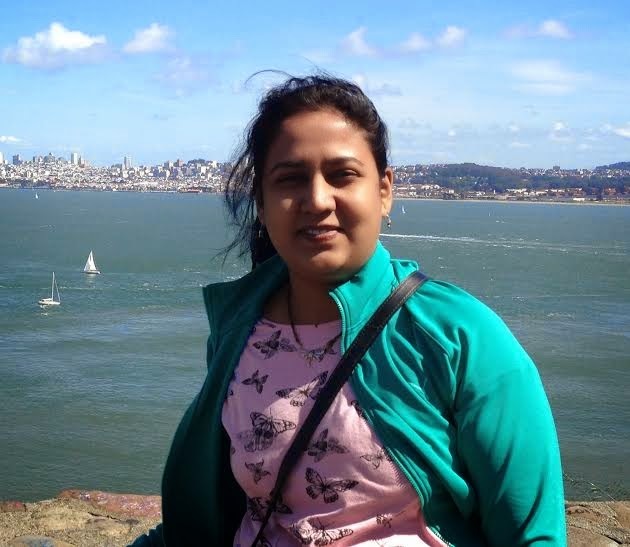 This month, the spotlight is on Bhavana Kesarkar. 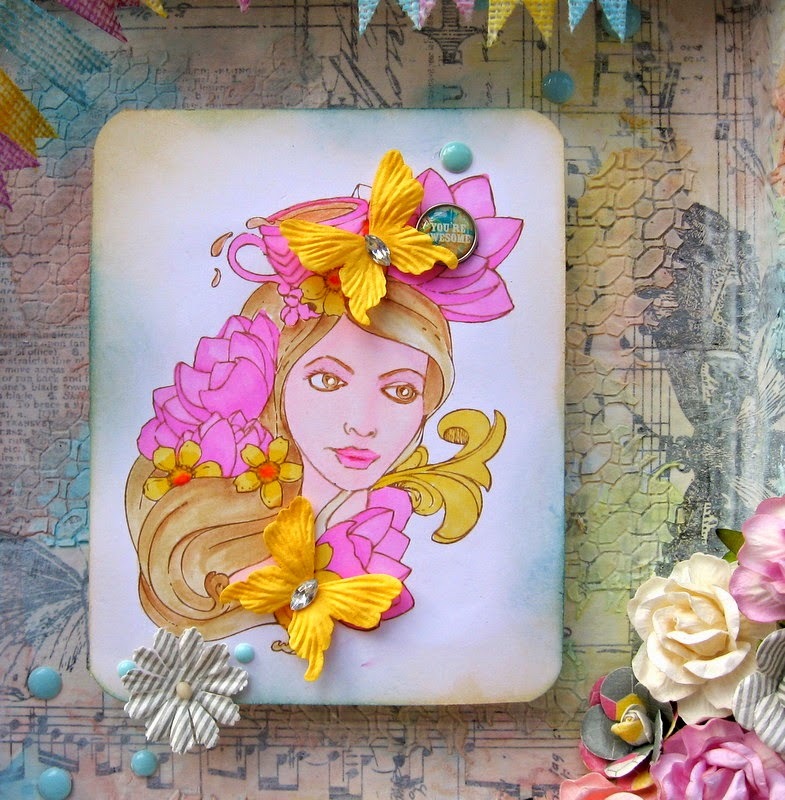 She plays regularly with our challenges with her very creative beautiful cards. Let us know more about her. Hi Everyone, I am Bhavana here. I have been crafting since my childhood. I always loved the craft classes in school. 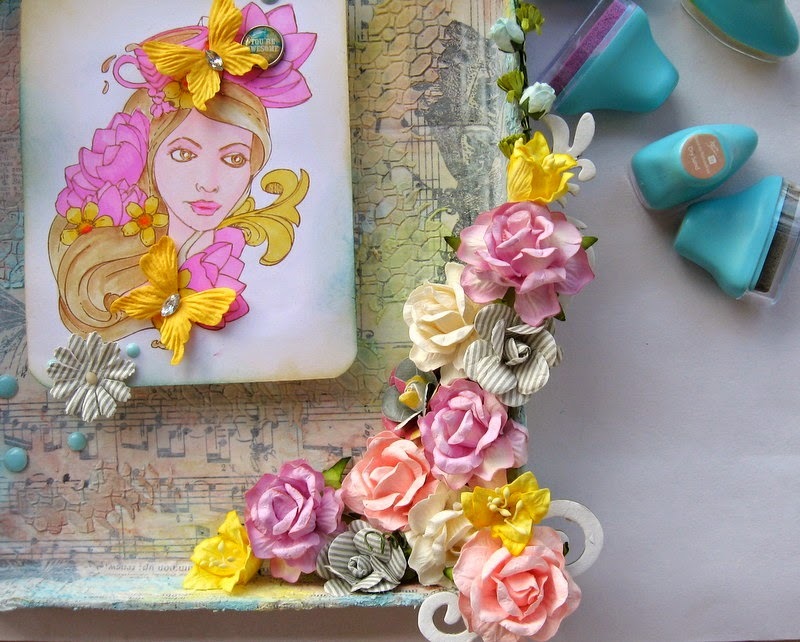 I started blogging to share my hobby on internet and I got know the whole new world of paper crafting especially making cards and I am kind of hooked to it. I get inspiration from everything around blogs,galleries, pinterest and I hope to inspire you with my small tutorial here. Here is simple way to make use of your dies for backgrounds. 1. 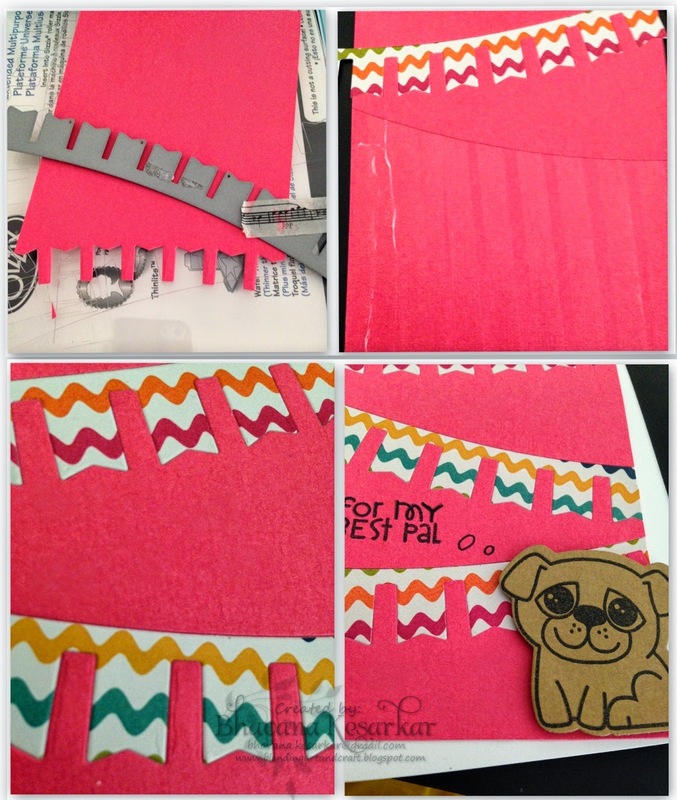 I have used a banner die and diecut on a pink base cardstock as you can see in the pic i have die cut it thrice. 2. Take another pink (same colored CS or different color) and tape runner. Make sure the glue is applied generously so that pieces wont come out. Then, adhere the pink cut base on another pink cardstock. 3. 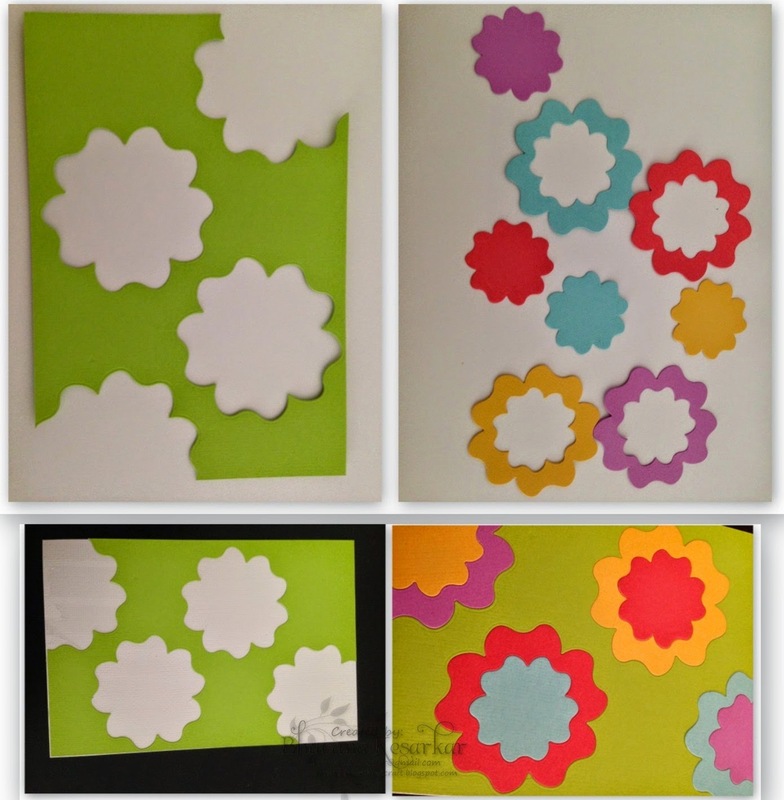 Cut the banner shaped diecuts either from pattern paper or colored card stock. Here I have used pattern paper. Once everything is inserted the background base is just one layer! And here are the 2 cards made using these background. Have made these cards keeping in mind the current challenge all the colors are chosen from new Lulupu logo and have used banners :) I wish all the luck to the new Lulupu. What a creative way of using your dies. I hope you take a few minutes to visit her blog and leave her some love. Well friends, time is running out fast to enter this challenge,so if you want to win yourself this new release from Studio Calico, then don't forget to link up your entries here. 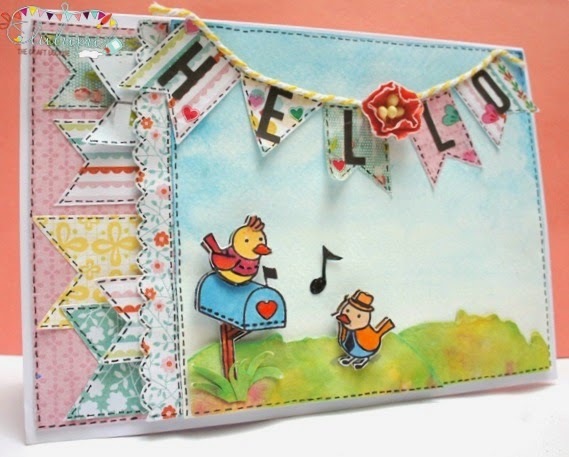 From the latest American Crafts release as colourful as our new logo! It's me Jaya with you today. Yes.. you heard it right! Lulupu has a revamped look, from the site to the blog, everything! Lulupu has great offers and hoards of awesome crafting stuff for you.So don't forget to register yourself. Keeping with the spirit we have put up a challenge for you all. 1.Use minimum 4 colours from the new logo . 2. Must include a banner or pennant on your creation. 3. Cards, layouts, mini albums, canvas, altered art all are allowed in this challenge. 4.Challenge will remain open till June 30th, 11.55p.m. Well here is my take on the challenge. I went crazy enough to incorporate ...I don't know how many, but definitely four ( which is a must) colours here in my card. Such cards are not my forte and I haven't ever tried my hands on them so this was challenging for me too. I did water-colouring to create my card. The sky, the grass and the stamped images are all water coloured. I used the Essentials- Mr Huey's water colour set. Water colouring is the new IN thing in card making these days. So Lulupu has stocked up some awesome brands for you to lay your hands on! The stamp set I used here is also from Lulupu which I won as a contestant in my first ever win at any challenge! So its kind of special and I decided to use it for this card. How did you like my work? Do let me know through your comments. You still have some time left to enter the Current challenge here. Lulupu has some mouth watering prizes for the winner. So go ahead and Good luck! To make this box, I have first cut and scored the cardstock, then measured and cut the pattern paper from the DCWV Fresh Floral Stack accordingly, and then covered all the four sides and the top of the box with it. Then, I created a small handle on the lid to make it easy to open and decorated the front of it using a die-cut panel which I have distressed on the edges using Crushed Olive Distress ink. I stamped the sentiment in the centre and also stamped, colored and fussy-cut the flowers and leaves using the Lawn Fawn Blissful Botanicals and Flutter By sets. Added the banners on the two sides of the box and a punched lace using the Martha Stewart Doily Lace which was then colored using Distress inks- Crushed Olive, Shabby Shutters and Tumbled glass. Hello friends! 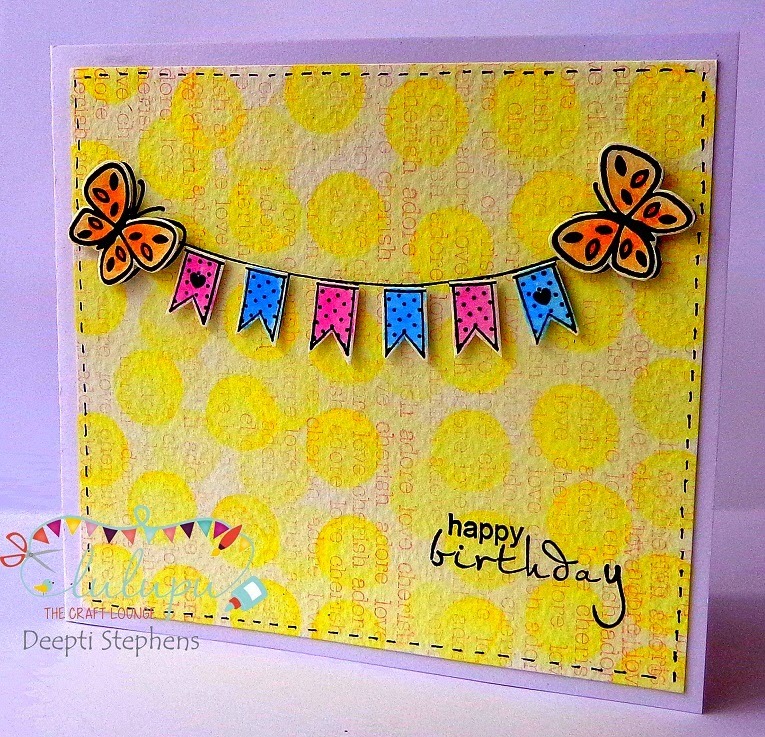 This is Deepti here with a fun birthday card made using the colors of new Lulupu logo. Hope you are enjoying our current special challenge.. Inspired by new Lulupu logo.. I just love the colors of new logo, they are so fresh and happy. And yes! we have a yummy prize too for the winner.. Kindly click here for more details.. :) Well.. I've made a video for you this time also. I've used many techniques like Stamp off, watercoloring, creating your own back ground, paper piecing and etc but I've concentrated more on one thing and that is 'Water Coloring with Memento Inks'.. I've shared a few tips and techniques I hope that might be useful and helpful for you guys! Kindly watch the video for more details..
Hope you like it, don't forget to play along with our current challenge..
As you all know, we have Special challenge for this fortnight. 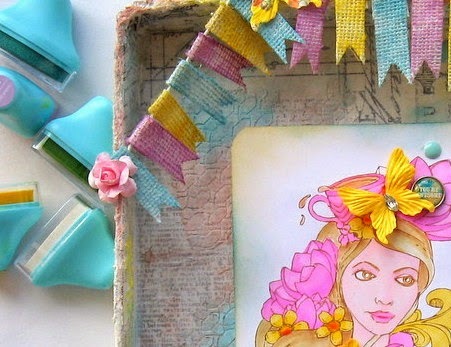 Lulupu has got new Logo with fabulous colors and you have to make craft/art inspired by this color palette. 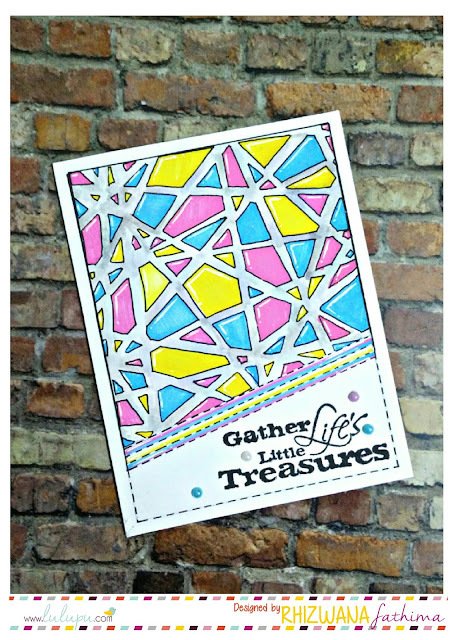 Winner will get yummy 'Lemonlush paper pad and Wonderlust stickers!!! Kripa is the host of this challenge and she has created the wonderful LO and its my turn to inspire you. 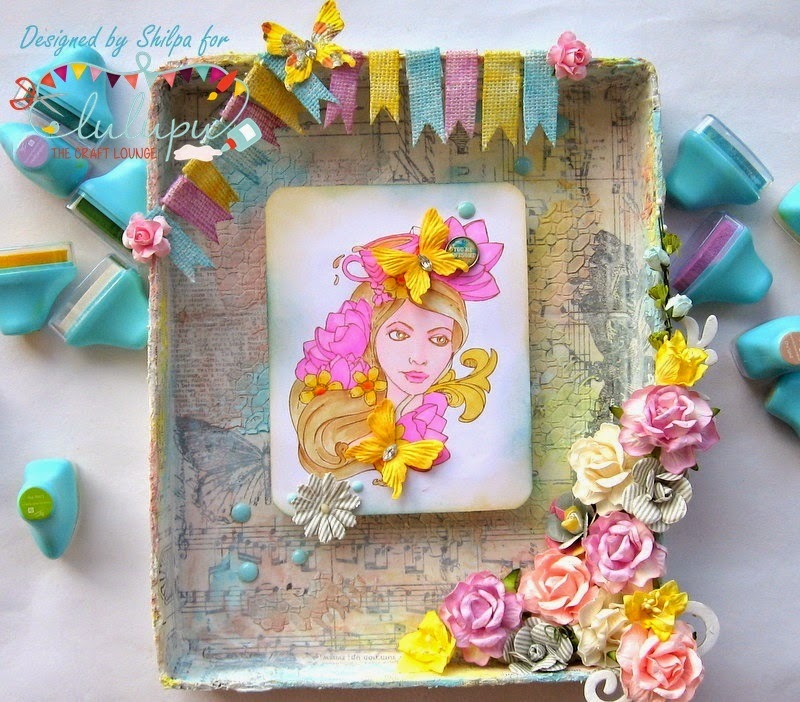 Today, I present you a Shadow box created with lots of new products at Lulupu store. I will take you through my project step by step and we will talk about the use of each product. I wanted to use this new Prima Bloom girl - Paige, designed by Jamie Dougherty. Ohh my!! what an Artist she is!! She has designed many pretty girl stamps.You can find almost whole range of these beautiful Girls stamps here at Lulupu. They can be used on cards too. 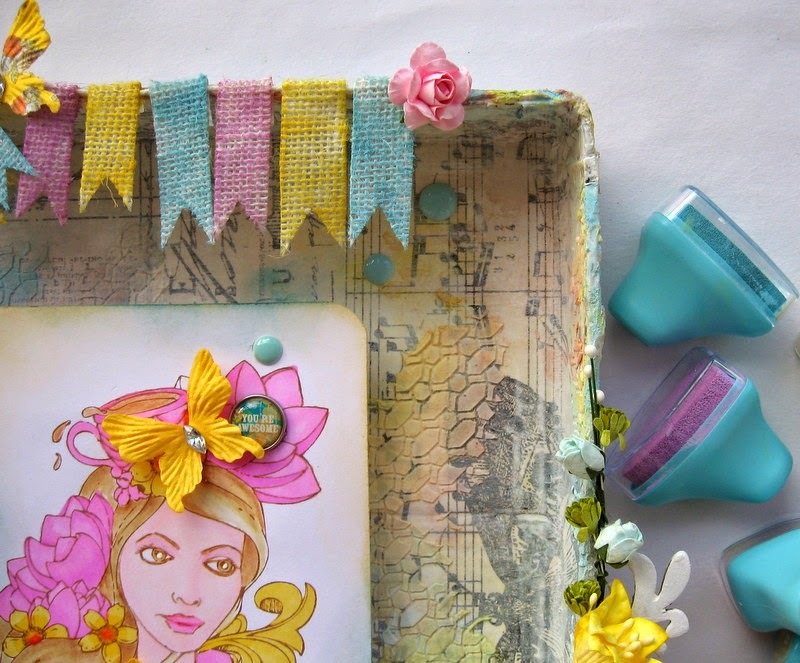 For making the background , I've used Tim holtz Tissue wrap, it has wonderful collage image. I adhered it to the box with Mod Podge. And let it dry. Tip: When you make mixed media, if you use Ranger Multimedium or Mod Podge, the base layer does not peel off even after adding many layers. My next application was gesso. You know, how much I love to create texture :) And I had new Wendy Vecchi white embossing paste to play with.....then what to wait for? It is a great product. I am loving it. It is thick, gives very different texture than other embossing pastes. We require it in small amt, does not smudge under stencil. It dries fast and opaque. I applied it through Memory box Cressida stencil. it is a must try!! 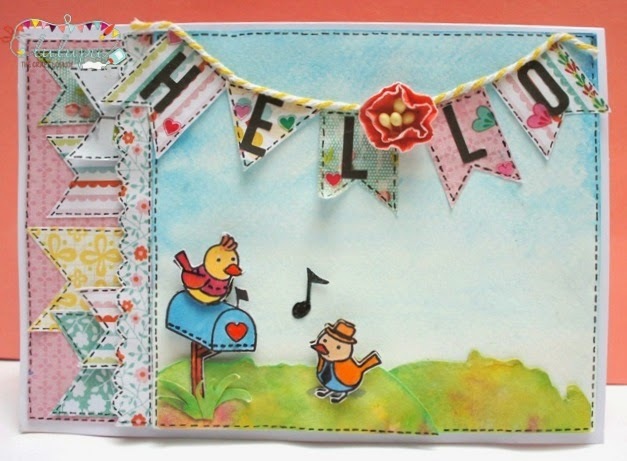 You can use it on Tag, Card or any Mixed media. The colors on the background are from the cute lil Prima Chalk Inks, I smudged ink on the surface, used baby wipe to spread the colors. Many of you, know these inks. They are small and ergonomic i.e. easy to handle, very juicy and quick drying. They are perfect for stamping, for background coloring, for distressing edges, coloring embellishments, can give more dimension to embossed design. Available in two varieties - Fluid and Resist Chalk Edgers. Some flowers in my shadow box are from Prima and some are handmade. I wanted to bring on grey, as it is one of the Lulupu color, and I found beautiful grey roses in Prima Hello pastel pack. I've colored my flourishes with white chalk ink. And here she comes, Paige!! It is a big size rubber stamp, stamped image is five and half by 4 inches. I stamped it with coffee Archival ink, and got crisp image...Wow!! I colored her skin and flowers around her with Shinhan markers. For her hair I used distress inks. And you will find complete picture of Shadow box below..
At Lulupu, as much as we promote and sell new wonderful crafty products, we support recycling too. You will be surprised to know that, the box I've used here is a packaging box in which I received my crafty items!! I customized it according to my requirement. the information I shared would be useful to you!! Let us see where can you take your creative flight with these delightful colors! !